Wrap me is seaweed and banana peel then light me on fire! 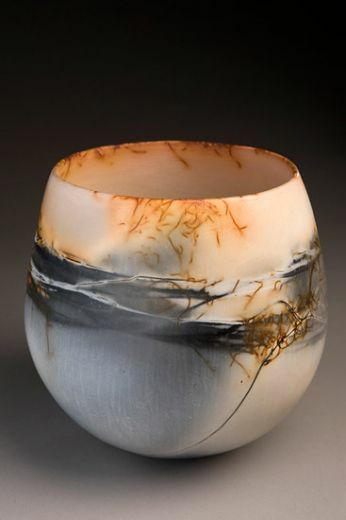 Contemporary wood fire, Raku fire, pit fire and electric kiln studio potters can use the Saggar technique to create decorative pieces as seen here by June Ridgway. In this example, a Saggar firing was used to create a localized reduction of the kiln atmosphere as well as a concentration of the horse hair on the ware. A Saggar is a structure with a fitted lid that can be made from metal, kiln shelves, paper, tin foil or Raku clay. It encloses a piece of pottery, such as the pot seen here, to keep combustibles contained to cause incredible effects. Saggar Firing was originally designed by the Chinese to keep wood ash and flame-flashing off their glazed pottery when firing in a wood burning kiln. Today Saggar Firing is the reverse, where the studio pottery introduces combustibles that will affect the pottery. Saggar firings have special preparation. The pottery created for the firing is not restricted to a particular body like its kin firing Raku. Once the pots have been bisque-fired which is a common practice for electric kiln firings is, the pieces are ready to be embellished. Pots can be decorated with a terra sigillata. This is a slip from dry clay mixed with water. A potter typically applies 3-5 coats of the terra sigillata to the pottery and then sets it dry. Taking a smooth flat pebble, back of a spoon or a chamois, lightly burnish the pottery to achieve a gloss finish. Pots can be decorated at this time with horsehair, seaweed, copper or steel wire, hay, pine cones or pine needle, banana peels or corn husks to create the thin black lines seen in Ridgway’s piece. The material is held in place with twine or copper wire or tin foil. Prepared pots are cradled into Saggar. The Saggar is filled with materials such as sawdust, salts, copper carbonate, copper sulfate, manganese, red iron oxide or metals but not too much. Over saturation of combustibles will prevent appropriate oxidation and cause the pot to turn dark in color. This is the key to a successful Saggar firing. A mixture of different organic materials is suggested to create unique results. Now that the pieces have been prepared comes the firing process. The kiln is stacked with the pottery and the fire begins with a soft flame. It is gradually increased until the kiln reaches 1500°, the wood fire can be extinguished or gas burners can be shut off or electric kilns can be turned off. The potter will leave the pots in the kiln until cool to ensure the slip has adhered. Results are never the same since the potter has no control over combustibles or the fumes which create a lovely one of the kin piece as seen here.